Mar. 22, 2019 – Serenely nestled in a pasture of green grass, surrounded by budding trees, the inaugural Murphy Veterans Tribute Gala was held on Mar. 22, at Cross Creek Ranch on Dublin Rd. 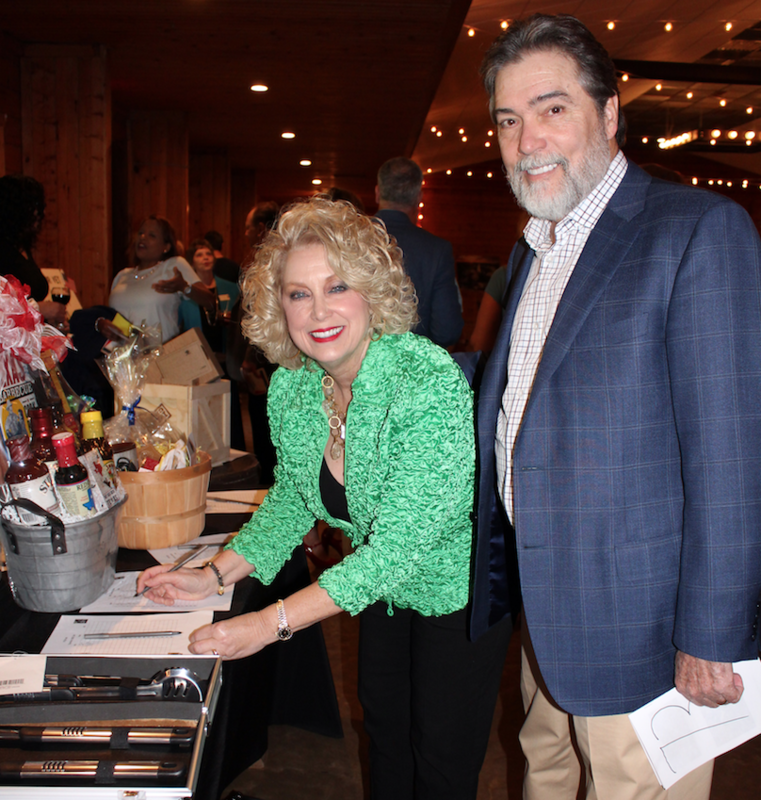 Attendees were greeted at the venue door by Donna Jenkins, President of the Murphy Historical Society, and then invited to peruse the silent auction items, enjoy a drink at the complimentary bar and mingle. Mary Pat Elledge, Committee Chairperson of Murphy Veterans Tribute (MVT), welcomed guests and stated, “We are so excited to have you here to learn about the Tribute, but mostly to have a really good time.” Veterans in attendance were asked to stand to be recognized. Elledge said that the funds raised at this event were earmarked specifically to have the land, which was donated by the City of Murphy, surveyed and to get an engineering report. Once these processes are complete, bids will be received to build the Murphy Veterans Tribute. Natalie Woods, TV personality of “Hot On! Homes” emceed the event. Barrett Phillips (Wylie High alumnus) performed a crowd pleasing variety of country, rock, classic and contemporary music while attendees dined. Colleen Frost at the dinner buffet line. Looking at the architectural rendering of the MVT, you will see six “arms” reaching skyward. The six arms represent the six U.S. military branches. Just as those arms reach upward, so did the arms of attendees during the silent auction. Eleven auction items were listed on the program, however, as the night went on and the generosity poured forth, some items were auctioned twice and some items were spontaneously added to the auction block. The top dollar bid went for a private dinner for 10 guests to Fogo De Chao Brazilian Steakhouse, donated by Fogo De Chao. The item was valued at $1,500 and sold for $2,300. A Glock 43, 9mm pistol, donated by Natalie Wood/Texas Gun Experience sold for $1,350. A patriotic vase, which was a simple stage prop, was a very last minute addition to the auction. Attendees sweetened the “pot” by stuffing it with cash and gift cards. It sold for $650. Murphy Mayor Pro Tem Jennifer Berthiaume and Ryan Sullentrup are greeted upon arrival by Donna Jenkins. Jim and Carolyn Mobius enjoy the complimentary bar. MVT welcomes anyone who would like to help them reach their goal to contact them at murphyveteranstribute.com. “Everyone is welcome and the skills that they possess can be put to good use for the benefit of the Tribute.” They are particularly looking for those who can help with grant writing, ‘in kind’ landscaping and clearing the land as well as helping to get the word out about the project to the community, other areas and larger companies. The Websters place a bid on a silent action item. (From left) Lou and Sue Diamond, Mary Pat Elledge, Donna Jenkins, Natalie Woods and Scott Phillips.